Brian has been filling up the blog with some awesome posts about his new/used Miata and tons of cool stuff he's been working on, so to go back to car maintenance 101, the best I can show you right now is a basic wheel rotation and oil change from yesterday. As Monty Python once said, "And after that, we'll build a nuclear bomb, and learn to play the flute"! My Italian car (that was built in Mexico) sent me this message in English the other day: "Have Engine Oil Changed". My first thought was that it sounded like a command to take my car somewhere and pay someone else to change the oil. Why didn't it instruct "HEY YOU, GO CHANGE YOUR OIL SO THE ENGINE DOESN'T EXPLODE"? Enough deep thinking about communication between machine and driver, let's get to work! After getting some oil filters and more oil from Amazon, a quick visit to the local AutoZone for some gloves and a new oil catching thing I was ready to operate. I'm not a big baby, so let's just say the rubber gloves are handy for keeping oil off your hands. Here is our patient ready for the operation! According to the FIAT manual, at oil changing time you should also rotate the tires. For me that translates to taking off the 17 inch wheels (Dunlop tires) pictured here that I use for autocross and put the stock 16 inch wheels (Pirelli tires) back on. So far I'm at 35,000 total miles on the vehicle, and with changing wheels on and off I figure it's a great work-out for the entire body too! On the left, we're looking from behind the left rear wheel towards the front, with both left side wheels up in the air it's time to take these off. One bonus for having a small car like a FIAT or a Miata is that you can jack it up in one spot and get two wheels off the ground, so that just speeds up the process compared to having to jack up each wheel individually. Of course a nice $2,000 four post lift could get all wheels off the ground at once, so keep that in mind at Christmas time when you are looking for that ideal gift! Since it's election week, I wanted to give equal time to both the left and the right, so here's the right side with the rear wheel removed. There is probably some legal reason to say right about now "DO NOT DRIVE VEHICLE IN THIS CONDITION!" Time to move on to oil changing, Both sides are jacked up in the front and on jack stands. Feel free to Photo Shop out the stands and tell people I do wheelies in my garage! After draining the oil from underneath, it's time to take out the old oil filter. 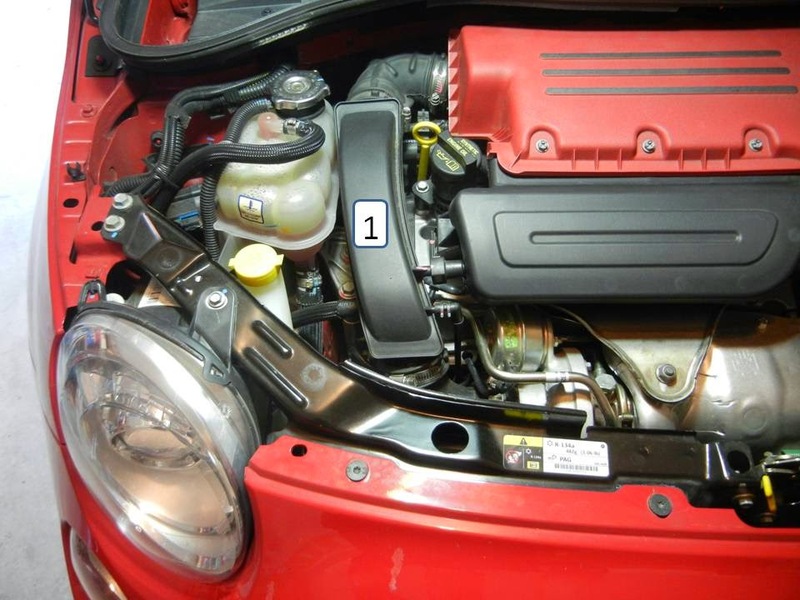 On the Abarth, it's only reachable from the engine bay above, and is going to require removing just a few things in our way. 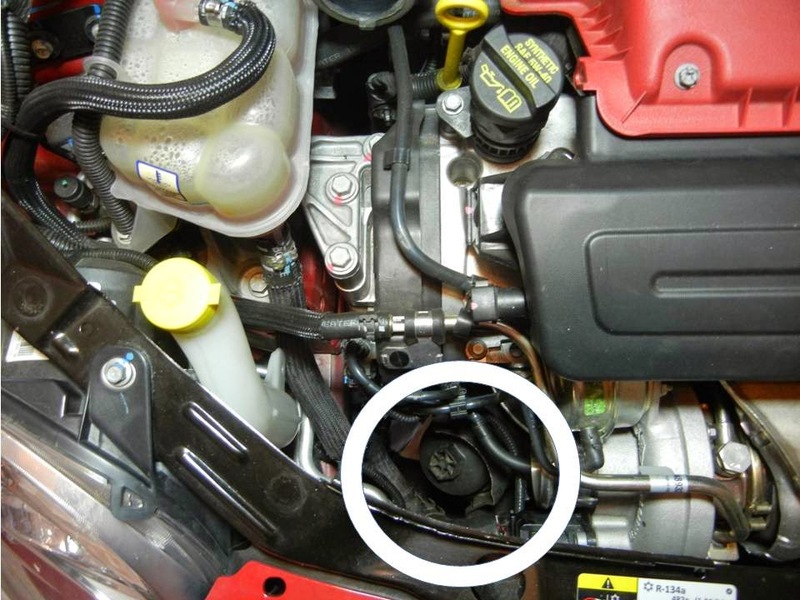 First up, we're going to loosen a few clips and hose clamps to remove this part of the air flow (number 1 in the photo). This part is easy, and just means pulling out a screwdriver and maybe some pliers to loosen the hose clips. Here you can see that part #1 is gone, and now we need to remove a smaller section of hose, the little curved elbow marked #2 in this photo. 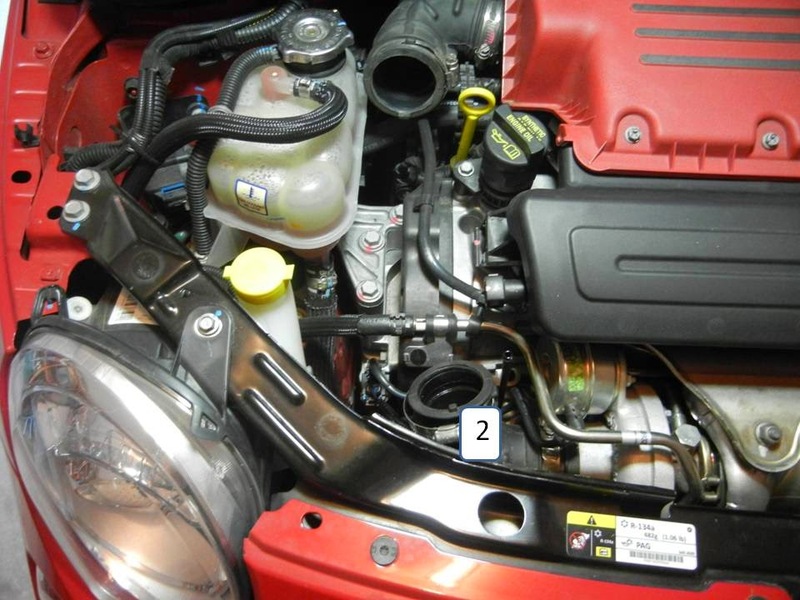 With #2 out of the way (no comments on that statement if you please), we can finally see the oil filter cartridge. We're pretty much looking straight down, and you can see the filter cover/cartridge thing with the hexagon shaped bit on top inside the handy white circle I drew on it for you. For the Abarth, I have to put together a couple of socket extensions and a swivel to get my wrench way down there. Oh, and a huge 27mm (or so) sized socket to wrench this thing loose. Once this thing is loose, you just need a 7 foot dude or a gorilla with equivalent arm length to reach in there and pull it out, hopefully without spilling any oil. Of course as a semi-professional jack-of-no-trades, it's pretty easy to work the wrench with all those extensions with one hand and then shoot high quality photographs like this with the other. Imagine what you could do with a third hand! Looking straight down on this angle. Isn't it fun working in small engine bays? And Voila! Here is the oil cartridge with a squeaky clean new Mopar oil filter inserted, ready to put this thing back into the engine way down inside there. There is still something funny to me about putting a Mopar branded part in my Italian/Mexican/US car, but that's the way we roll in the 21st Century! Thanks for reading part one, next time I'll share some exciting wheel changing and wheel cleaning photos!